← Random Panel: Super-mothering-skills GO! Perhaps Jimmy got confused, and thought he was Supergirl's best pal, and so wore a costume to honor her. Or maybe he just gets his jollies flashing the crowd as he uses his newly acquired power of flight. Regardless, if you're dressed worse than a guy with his underwear on the outside and a trapeze artist, odds are you should consider going into a different line of work. Or at least a different line of fashion. Actually, his costume reminds me of the old Robin Hood outfits (I’m not saying that helps matters, but still). 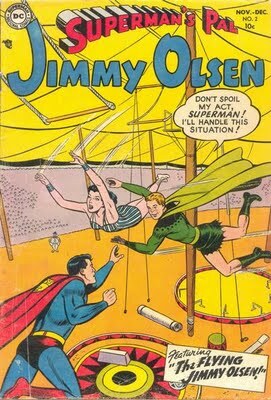 On that fateful day the crowd at the circus discovered that Jimmy Olsen is Jewish. He’s definitely light in his loafers on this one. Or maybe he’s just Scottish – a very strange clan, though. Wow. I didn’t know that one of Jimmy O’s vast array of superpowered personas included a cross dressing Cirque Du Soleil clown. He shoulda signed up for “Zumanity”. Aw, C’mon! What Real Manly-Man Superhero wouldn’t want a puke-green cape, a short skirt, and jackboots 🙂 ? Nah, I agree with Jeff. Wasn’t intentional on Jimmy’s part. Personally, I suspect the costume’s the one in charge. Note, for example, that it looks like the cape is what’s really speaking. My guess is that Weirdness Magnet Jimmy got a little too close to the magician’s props, and then got sucker-punched by a living costume, which pulled itself onto him. @Jeff: Yes, it shall feed off of his stupidity….